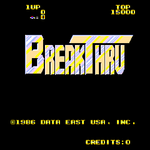 Breakthru is an horizontal side-scrolling arcade shoot'em up. The player controls a buggy (a car) who must avoid dangers and shoot enemies. The horizontal scrolling is automatic, although the player can increase the scroll speed by going to the rightmost edge of the screen, and slow it down again by going to the leftmose side. The buggy can move in all eight direction, shoot and jump. The games has five stages, all with a different theme, as the player gets closer to the goal: To reach the stolen sky plane and bring it back. The game contains no power-ups to the vehicle, but unlike normal shoot'em-ups, the buggy can jump over obstacles in the road. The arcade was ported to several systems. The NES version, however, seems to have no Japanese release.